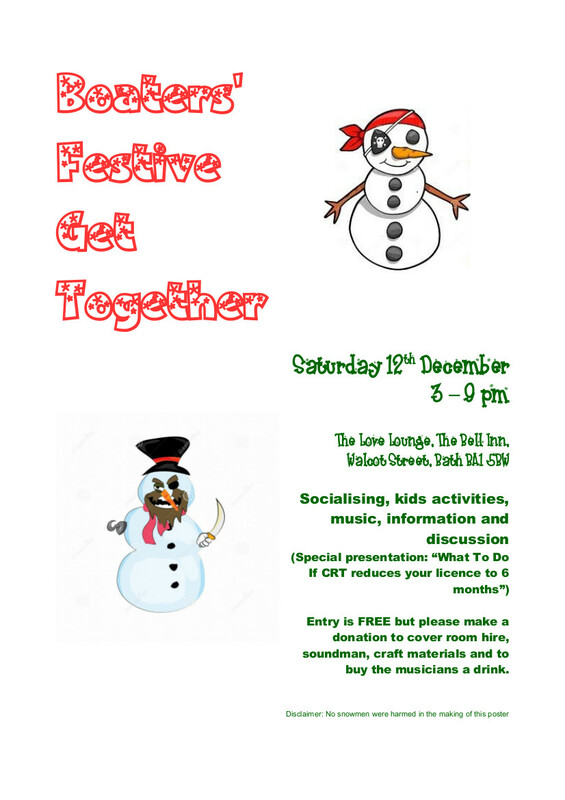 There will be a family-friendly festive get together for boaters on Saturday 12th December, 3pm-9pm, at the Love Lounge, The Bell Inn, Walcot Street, Bath BA1 5BW. The event will include children’s activities, music, information and discussion about what to do if CRT has refused to renew your boat licence for 12 months. There will be time to socialise and sing a few sea shanties too. Entry is free, but donations will be appreciated to cover room hire and to buy the musicians a drink. No need to book – just turn up with your kids! This entry was posted on Sunday, November 29th, 2015 at 5:35 pm	and is filed under Community. You can follow any responses to this entry through the RSS 2.0 feed. You can skip to the end and leave a response. Pinging is currently not allowed.